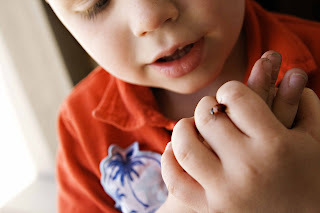 Parker is infatuated with bugs of all kind so when we found this ladybug he wasn't going to let it out of his sights. Unfortunately he crushed the wing of the ladybug and it couldn't move and that is when he informed me that it needed batteries. 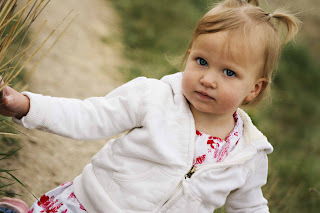 The other picture is of Emma on our little adventure that didn't last very long- Parker said it was too cold- Spring is taking a long time to fully get here! Look at Emma...she is turning into a little girl. I can't believe how long her hair is. Parker is funny. I love his batteries comment. They are growing way to fast!